If it is not raining it is our policy to complete the job as scheduled. If it is raining but the precipitation is light we will proceed as scheduled because rain does not affect the cleaning (see next paragraph). In the circumstance of heavy rain/ showers or high winds, we will re-schedule your appointment (usually within 2 or 3 clear days). All inside work may be completed as scheduled to avoid disrupting your busy calendar. 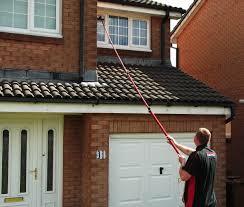 If you have an appointment with inside cleaning services we will confirm by telephone the morning of service. Inside your home airborne dirt from heating & cooling systems, fingerprints, pet smudges and cooking residue all collect on your window surfaces forming a hazy layer. Outside your home other contaminants such as dust blown from the wind and lawn machinery, bird droppings, sprinkler water overspray and tree pollen obscure your view. Choosing All Clean Property Services will allow you to enjoy the beauty of your home and see clear views of your neighborhood scenery. Because we use only the finest methods and cleaning solutions to wash your windows, typically your windows will stay sparkling clean even after it rains; however, if it rains within 48 hours of your window cleaning service and you feel your windows still don’t look great, and you call in that time period, you get a complimentary touch-up on the affected windows. 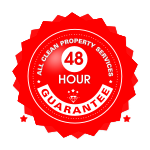 Please note:Your request for us to touch up your windows must be made to us within 48 hours of your original window cleaning appointment.